Louis XIV of France, popularly known as the Sun king on a portrait by Hyacinthe Rigaud, done around 1700. The French king is shown with all the signs of power, which show that his reign is legitimated by the grace of God. This portrait was the used as a blueprint for other similar portraits of European monarchs of the time. Absolutism is a form of government where one person, usually called a monarch holds absolute power. It is in contrast to constitutional monarchy, which is restrained or controlled by other groups of people. Controllers may be such as clergy, lawmakers, social elites or a written constitution. Virtually all monarchs in the Middle Ages were absolute rulers within their kingdom. 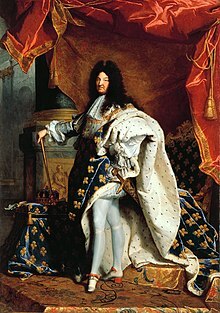 After the French Revolution (end-18th century) it became ever more common for monarchs to be limited by a constitution.